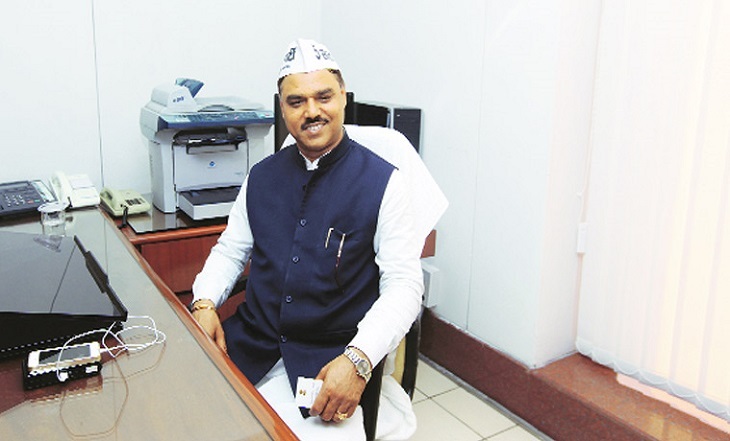 New Delhi: Delhi Law Minister and Aam Aadmi Party (AAP) leader Jitender Singh ​Tomar was arrested in connection with the fake degree row. Delhi law minister Jitender Singh Tomar was arrested on Tuesday on charges of allegedly submitting forged law degree while filing his nomination for the assembly polls. Delhi Police took Tomar, 49, to Hauz Khas police station, where tight security measures were in place. Meanwhile, AAP leader Sanjay Singh accused the Bharatiya Janata Party (BJP) of political vendetta, saying that Tomar was arrested just to put pressure on him and questioned the motive behind the arrest. “Tomar has been arrested without any notice or prior information. What is the BJP government doing?” asked AAP leader Sanjay Singh. “His case is under the court’s jurisdiction and the university has also filed a reply in the court stating his degrees are fine,” said Singh. Congress has said that “law should take its own course”. Delhi Police took Tomar, 49, to Hauz Khas police station, where tight security measures were in place. A team of the Delhi Police recently went to a Bhagalpur university to probe Tomar’s law degree which was revealed to be forged. The minister’s arrest came at a time when the Arvind Kejriwal government is embroiled in a tussle with the Centre and both side moving court over the division of powers. The Aam Aadmi Party (AAP) accused the Bharatiya Janata Party (BJP) of political vendetta, saying that Tomar was arrested just to put pressure on him and questioned the motive behind the arrest. However, at the time of filing this story, there was no official confirmation about the minister’s arrest. Delhi police chief has feigned ignorance about the arrest. AAP government in Delhi is already at loggerheads against the Union government demanding the police be brought under the control of the state government. Soon after the arrest, Aam Aadmi Party (AAP) came out in an open defence for Tomar. Lashing out at BJP, the AAP termed it a conspiracy staged by the NDA led government. AAP leaders on various TV channels also questioned the motive behind his arrest saying the case was sub-judice, so he couldn’t be arrested. An RTI reply had in April revealed that Tomar’s undergraduate degree was fake just days after a Bihar-based university told the Delhi high court a provisional certificate he used to enrol as a lawyer was fabricated. Dr Ram Manohar Lohia Avadh University in Faizabad and one of its affiliated institutes, the KS Saket Postgraduate College in Ayodhya, said the minister’s BSc second year mark sheet was fake and his degree invalid after a Ghaziabad resident filed a Right to Information query. The college also said the 48-year-old Tomar never took admission in the institution, in a reply to a separate RTI application. University sources said the roll number series on Tomar’s mark sheet was bogus and the vice-chancellor’s signature on the degree entirely different from the original one. AM Ansari, the controller of examinations at Avadh University, told HT he inquired about the authenticity of Tomar’s BSc second year mark sheet and conducted an in-depth probe, finding the documents to be false. Bihar-based Tilka Manjhi Bhagalpur University had the HC in April that the provisional degree on the basis of which Tomar enrolled as a lawyer is fake. An inquiry report submitted by the university to the court said that Tomar’s provisional certificate purportedly issued by the university is “fabricated and does not exist in the institution’s record”. The university’s report said the serial number of the provisional certificate in the record showed the name of some other person and not that of Tomar. The university was responding to the notice issued by the court on a plea alleging that Tomar got himself enrolled as an advocate on the basis of a “false and bogus” graduation degree. #ModiScaredofArvind – this is proven yet again! #ModiScaredOfArvind ????? Ok ok….wait for a minute…. What ????? ????????? #ModiScaredOfArvind There is something called illusion and this hashtag is a perfect example. #ModiScaredOfArvind If law minister is arrested in fake degree row which is big crime then why only modi even I’m scared of criminal arvind.